I loved my community college it was the perfect way to help me transition into the college life. It helped give me a clue on what to expect, taught me what I could handle and what I couldn't, and it taught me what I could do when I push myself. However at some point, it's time to move on to a four-year university. The idea of that terrified me. Last year I started on my university search attempting to find the perfect college that fit what I aspire to do. They are so many possibilities it was a bit overwhelming. All community colleges have "sister" universities they try to direct the students to. Although that's the easier option I wanted a new scenery somewhere else. I looked for colleges near my siblings. At the time, I wanted to be a bit closer to the family. I complied a list of things every transferring student should consider if they don't want to attend the sister university of their current college. It is inevitable college is expensive and some of us get scholarships and grants but, there is a chance it's still not enough to pay for college. Hello, student debt. So I recommend you compare the prices for all the colleges you're looking into as well as what types of scholarships they're offering you. Note you can find a few scholarships of your own as well, there are even transfer scholarships available for students. My favorite site to go searching for scholarships is Unigo.com. They have really fun ones there and the site is very user-friendly. Don't forget to fill out your FAFSA every year in January and send it to the school of your choice. Not only do you need it to apply for financial assistance you might also need FAFSA information for scholarship applications. 2. Do they accept my credits or Nah! This is a make or break factor for me. I don't want the years I spent in classes and late nighters going to waste because the university I want to attend won't accept my credits. So it's good to keep in mind not every school is going to accept your credits. Some universities have the option for you to search how your credits will transfer. If all else fails you can always call the admission office and see if an advisor can help explain it to you before making your decision. 3. Do you even have my major? Of course, this is a must! Do they have all the possible major and minor programs you want to take? The original university I wanted to attend didn't have a marketing program. They told me to get a degree in business administration and I'd have a marketing class incorporated in that. Which is fairly different than an actually marketing degree program. Although, I was willing to overlook that setback because the school was amazing. I finally found a school that offers both a psychology and marketing degree program. I'm happy that I didn't have to sacrifice my goals and dreams. So my advice is to ensure they have the degree programs you want to study in. The best way to tell if a school is a great suit for you is to visit the campus. Look out for transfer visit dates and open houses. I think those are the best times to go since you'll be with a group. It's nice to hear others questions about the campus you might have never thought about asking. As well as hearing others perspective about the campus. I'd suggest going with family and friends let them weigh in on what they think. As cliche as it may sound, there's always a feeling you get when you visit campuses like "this is home". So be sure to be asking yourself "Can I be happy living her for the next few years?" Have a Plan A, B, and C. If your first choice turns out to be too expensive or something happens to change your mind. You need to have a backup school that you love just as much. I had three schools in mind that I wanted to transfer to. I ended up choosing one that wasn't even on my list. So it's great to keep an open mind and give yourself some choices. What kind of deadlines should you be wary about? Application , scholarship, fee, and paperwork deadlines. For a school, I'm wanting to attend they have a deadline for when you need to have all your transcripts turned in, applying for housing, and etc. So make sure to look at the deadlines and add them to your calendar. I find it best if you make a checklist of everything you need and when they're due. Make sure to be marking off items on your list one step at a time. Some schools might even send you a premade checklist they've come up with everything you'd need to get done and by when. I'd take advantage of that. 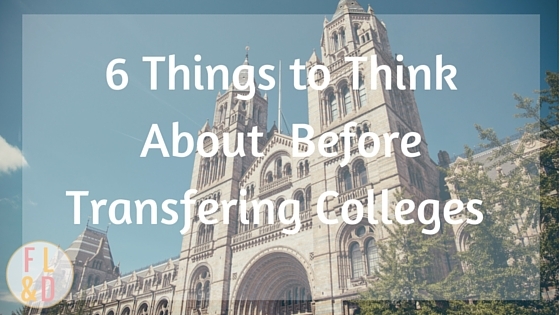 There you have it six things you should consider when transferring universities. I know it may seem intimidating, time-consuming, and something you're dreading. When the process is all over it's definitely worth it. There are so many different schools to choose from. I hope you pick the school that best fits what you want now and where you want to be in the future. What's your advice for transfering students?